Get regular updates on the world of yoga, upcoming events and trips, and tips on how to live an active lifestyle through mindfulness. We won't share your email address with anyone else and will only send you news about Yoga Health Wirral, and will keep your email address for as long as the business is active. Your email address is stored on our MailChimp list. You can subscribe at any time by clicking ‘Unsubscribe’ in any emails we send you or by emailing us and asking for your data to be removed. Thanks for subscribing! Please don't forget to check your inbox and confirm your subscription to be added to our list. Hi! My name is Sue Watson and this is Yoga Health Wirral. It's my own business, and I'm a qualified teacher with the British Wheel of Yoga and also a BWY Foundation Course Tutor. For me, yoga and mindfulness offer simple techniques and exercises for connecting the mind to the body. It can help people to cope with the stresses and strains of everyday life, and can totally revitalise the body and mind. Yoga is for all ages and abilities, providing a calming and soothing influence, and helping to develop and improve powers of concentration and sense of relaxation and well-being. Yoga Health Wirral runs weekly yoga classes throughout the Wirral and also teaches eight-week mindfulness courses for adults and Mindfulness in Schools for Children and is a BWY Foundation Course Level 1 Tutor. Click on the buttons below to get in touch with me and to find out more about the sessions I offer throughout the Wirral. I look forward to hearing from you! Following on from the success of Wirral Yoga Festival last year we are pleased to announce we are running the Festival again this year this time at the historic Hulme Hall in Port Sunlight. Sessions will include yoga, meditation, pranayama, mantra, relaxation and Yoga Nidra. There will be a variety of teachers and guest teachers so you can tailor your day to suit your needs. Following the success of the 2018 Italian Yoga Holiday to the Masseria, this holiday will be during the late spring/early summer when the blossom and poppies are in full bloom. 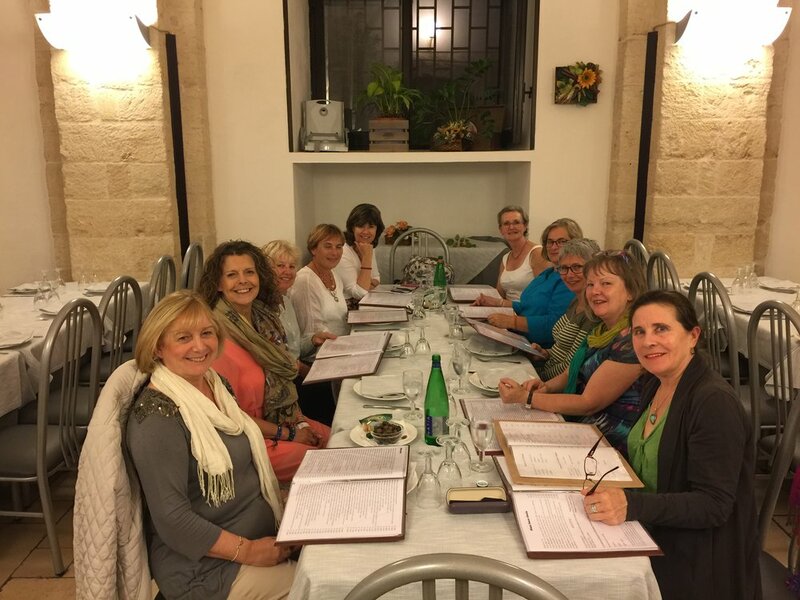 In between yoga and meditations practices we will explore the beautiful towns of Polignano, Monopoli and Alberobello to enjoy sight- seeing a meal and ice cream! Also, we will experience the wonderful taste of the fresh abundant vegetables and fruits of the Mediterranean as well as the freshest fish from the Adriatic sea at both the Masseria and when sight-seeing. Gentle restorative Hatha yoga for all ages and abilities. classes are very gentle using props and supports to enable all students to access the healing power of yoga. Sue has been practising yoga and mindfulness for years and is a qualified British Wheel of Yoga teacher and Foundation Course Tutor. Sue is also a yoga therapist with the Clear Mind Institute. She has earned a Teacher of Mindfulness Level 1 certificate with the Institute as well as her Teacher in Mindfulness with Mindfulness in Schools Project .b and Paws .b. Sue is also a qualified teacher of baby and children's yoga. The course is 60 hours over a 10 month period taking place each first Saturday of each month. · A folder (preferably with dividers for the different course materials. Yoga is more than a way to stay healthy. What is the goal of yoga? Are we allowing our heart to grow? Autumn leaves and grassy hills, can we loose ourselves in nature? Living in the moment doesn’t come easily most of the time as we are drawn in all directions being overwhelmed often with the demands of daily life, but, the more we practice Present Moment Awareness the more we can store those awareness memories and sustain ourselves when the sun is not shining in our daily life! So, is it Spring? In times of uncertainly what measures can we take to help steer a steady course through the difficult and often seemingly impossible? The Yoga Sutras of Patanjali provides us with ancient wisdom and insight. It has numerous other incredible benefits including increased flexibility, improved elasticity of ligaments and tendons, stimulates internal organs, improved breathing, tones muscles, and more. The mental benefits of yoga are also well-documented, with even simple meditation exercises helping to de-clutter the mind and improve concentration. It helps to focus the thoughts and relax, providing a greater sense of calmness, tranquillity, and peace of mind. Mindfulness is being aware in the present moment, moment-to-moment, using the breath as an anchor for the mind into the body. Mindfulness is about paying attention to an experience as it happens and as it unfolds, rather than worrying about what has happened or might happen. It trains us to respond skillfully to whatever is happening right now, be that good or bad. The point of mindfulness is to feel calmer, think more clearly, and perform better. It also helps people of all ages to learn more effectively. Automatic pilot – When we are on auto pilot we are not present in our own life, we are not there fully. We can rush through life without seeing, tasting, smelling or touching – we are out of touch with our world and ourselves. Take a moment to think of a scenario where you have been fully present. What were you seeing, feeling, experiencing? Take a moment to think of a scenario where you have been on auto pilot. What were you seeing, feeling experiencing? Mindfulness offers us a way to wake up from auto pilot. When we are out of touch and on auto pilot the mind is busy – daydreaming or planning, rehearsing or trying to achieve something. Our minds are taken over in DOING MODE! Our minds are working in the background without our knowledge, consent, or deliberate choice. We can explore the mind's lack of attention when we can zoom in with curiosity to what it is doing – exploring what is happening with a sense of curiosity but also kindness. The ancient Indian philosophy of health and wellbeing, ayurveda, is an incredible way to enjoy a healthier and more balanced lifestyle through good food, yoga, massage, and herbal remedies. Ayurveda means 'the art of living wisely', and like yoga is an entirely custom and flexible way of living. People that practise ayurveda say that it has helped relieve a number of various ailments including irritable bowel syndrome, migraines, PMS, insomnia, menopausal symptoms, and more. Yoga Health Wirral works with Sarah Beck, an experienced ayurveda practicioner and teacher, to help raise awareness of the lifestyle. Sarah is a professional British Wheel of Yoga tutor and has trained with some of the planet's leading authorities on ayurveda including Dr. David Fawley and Vaidya Artreya Smith. Sarah beck provides consultations and massages from £30 with sessions lasting between an hour and 90 minutes. Sarah can be reached through her website http://www.yoga-ayurveda.co.uk/ or by email at sarah.deva@yahoo.co.uk. "Sue's classes always leave me feeling relaxed, but at the same time, I know I have had a really good workout. Sue's knowledge of anatomy means that she understands exactly how to help individuals get the most from the practice, no matter how much or how little yoga they have done in the past.